РОССИЯ г.Волгоград Региональная выставка САС, эксперт Георгий Баклуш. . .
RUSSIA s.VOLGOGRAD Nationale Dog Show CAC, judge Rodina Inessa Call. . .
LITHUANIA s.MOLETAI Speciality Sigthound Show (CAC) , judge Vija Clu. . .
RUSSIA s.ROSTOV in DON Internationale Dog Show CACIB-FCI, judge Gali. 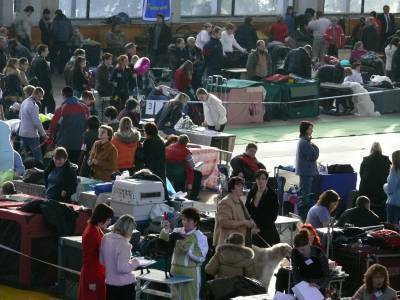 . .
RUSSIA s.SAMARA Internationaie Dog Show CACIB-FCI, judge Hassi Call. . . Welcome to the CALLISTO’s personal site! 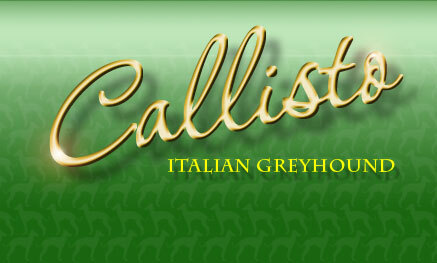 CALLISTO is a fine representative of the most ancient and graceful dog breed – ITALIAN GREYHOUND. 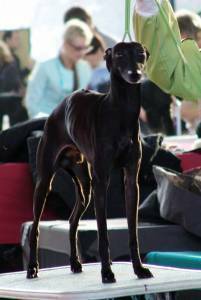 Italian greyhound CALLISTO (born February, 14, 2005) is the Central-Eastern European Winner, Champion Baltic, Eurasia, Balkan Countries, Inter Champion, Multi Champion – the Champion of Russia, Croatia, Latvia, Lithuania, Estonia, Bulgaria, Montenegro, Romania, Macedonia, Ukraine and Belarus. CALLISTO is also the Russian Canine Organization Champion and the junior Champion of Ukraine, Grandee the champion of Russian, Bulgaria, Romania, Ukraine, Belarus, Baltic Winner 2009, Zagreb Winner-2008, champion of Sighthounds Club Croatia , the Best dog of breed of 2009, Champion of the National Breed Club Russia, Qualification for CRUFTS 2009. CALLISTO’s pedigree, certificates and photographs are available on the site. You are also welcome to learn the Italian greyhound history, standards and comments to them. The link ‘Puppies’ enables to get acquainted with new CALLISTO generation and young champions’ achievements. Have a nice day! exceeds the proud of your glory! ‘A dog at home is no wonder. Near 1/3 of urban families have a loyal dog as a family member. Almost all public people – actors and singers, politicians and scientists – have different kinds of dogs at home. Our dogs are brought up differently and sought for differently/ As a rule they work either as guards or family toys. Sometimes a dog serves as entertainment for a child, sometimes is bought to escape loneliness. Yet there are very few dogs aimed at a completely different lifestyle – bright and brilliant! Namely them like pilots lead their breeds making the sofa dogs better as well. And I would like to dwell upon the best ones of them. I wouldn't even like to dwell on off-side watchers. Even dog exhibition people often discuss in back-room talks canine rules and orders. I wouldn't talk about the leaders of a performance like this. My speech is about real CHAMPIONS! About the ideal dog we aim at and that is still perfection that could hardly be achieved. The perfect show dog is a waking dream and a muse of canine handler! Like Pegasus, a winged horse, flies to the pots in the moments of inspirations, a show dog at défilé comes in dreams to very many of us. Naturally we are fond of our dogs no matter what they are like despite their merits and drawbacks. Both them and us have weak points – some brought up, some inherited. But CHAMPIONS are lords, princes of noble blood. They are pearls and rarity. They possess those wonderful characteristics that are not so often noticed in mere people. Aristocrats not only born but virtued; such dogs encapsulate all the best features. I adore you, champions, and not only your breed, grace and temperament, but as well I adore your temper, spirit strength and generosity. They are like diamonds out of precious stones and only need gem-cutting. The princes of noble blood, we shouldn't be scared of them even if they are big-sized because they wouldn't bother themselves with petty aggression. Often we hear that horses and deer are the most beautiful animals. I wouldn't argue but everybody felt creeps watching a Champion on the main runway very close to victory. Sometimes dogs make the audience applause. Finally Fortune, the goddess of fate, dots the 'i', and everything is clear. The Champion may be a glamorous cocker spaniel, a graceful Italian greyhound, an airy afghan hound, it may be either a weighty scottish terrier or an athletic Staffordshire terrier. What re they linked with, what make referees' and spectators' eyes glued to them? It's the strength of will, indefatigability, constant will to fight and win in the first place. How is the show dog exhibition organized? And why the place for a dog contest is called a ring? A ring is a place where the strongest should win. Ans the best dogs like armored knights gleaming their shiny skin and sculpturesque musculature come to 'fight' against each other. A small ground square fenced by a thin multicolored lace becomes a tilt-yard. This is a bloodless fight but there would be a winner! It's not the strength of grasp that rivals exercise but their dignity and noble background, in other words – aristocracy. Sometimes one can not even notice the dog's handler – that's because behaves as though it's the one to adore. Only the rules state an armor-bearer beside the knight. Once in a while looking at enjoying all the fuss and noise before the exhibition I recall Hans Christian Andersen's tale “The Princess and the Pea”. Any ideas what's this story is about? In my opinion it's about genuine noblesse. Spangling jewelry glamor isn't the core point. One can easily tell the Princess wearing jewelry and fine clothes and a luxurious ball, but noblesse is a different thing. In wet cast-off clothing, with legs beaten to the bones, frozen fingers and winded face one can't but tell a noble princess. Her grace, patience, kindness and extremely strong will point out her royal background. The true Champion is absolutely the same. As a frozen statue it can stand long hours having its hair cut. It can stroll on the runway after a sleepless night, set up strength in merely unbearable conditions: in a rumbling train, under an uncomfortable bus chair, in an cold and dark baggage section. It is able without a single emotion get dry at a fan found by quite chance after being caught in the rain and soaked to the bones. It can perform in trot on a burning pavement making the paws suffer. Then, feeling exhausted, when tough rings and numerous competitions are over, this dog, having stood still on the table for more than an hour until the final best, will make a move (as though outspread its invisible wings) and fly into the ring making spectators' eyes glued to its flight. As though there is no road behind in a shaky train (often from another city), exhausting heat or wet snow sticked to the fur. The Champion is like a lively sculpture with a never ending Duracell battery installed inside will share its light and make us still. Each of us involved in show dog play have dreamed of this miracle of nature. We try to reach this ideal trying to get complicated breed combinations and disparately searching in famous foreign kennels in order to make the dream come true so that the eye could rest on the ideal dog at every time – not only on the runway, but at home and at a stroll as well. Someone could be lucky, and his or her dream partly come true. However, the ideal, the unrivaled ring lord whose name is known to the whole world is far from easily achieved. Exhibition play is a kind of lottery. It is more likely to lose than to win. Sometimes we make mistakes taking the first puppy that occurs only because that it seems to us that it would be a Champion. Just consider loving a non-champion dog. What if you pet won't be able to fulfill all your dreams? What comes next? Unenviable fate – handler change or lack of love. No idea, what's worse. Would you worship your dog for its personal, spirit characteristics, or your insulted self-assurance and will for self-assertion would make you part with the dog? Genuine champions appear very rare, they are like fortune's gift. What about those who still only dream about Runway Lords? I would only wish you to love your dogs, and love them now! Those that are beside you even they are far from ideal. Be proud of them, take care of them, forgive them their weak points and appearance drawbacks. And let your CHAMPION dream come true!